At least one gunman took an unknown number of people hostage in a downtown Sydney chocolate shop and café in the middle of rush hour Monday morning. Television images showed at least three people holding up a black flag with white Arabic writing in the window. After about six hours, three people could be seen leaving the Lindt café, although whether they were released or escaped wasn’t immediately clear, reports the Associated Press. Australian Prime Minister Tony Abbot described the situation as “deeply concerning,” noting that while it wasn’t yet clear who was behind the siege there are hints it could be politically motivated. It also isn’t clear how many hostages are in the cafe although the deputy police commissioner said there are no more than 30 hostages. “Five different hostages have been sighted in news footage,” notes the Guardian. 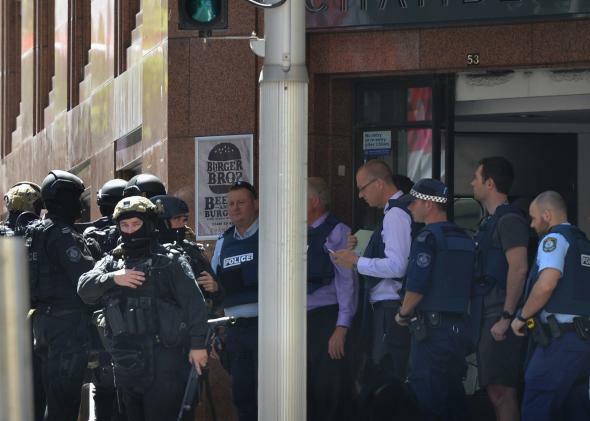 One witness who was in the café about 15 minutes before the siege started told the Sydney Morning Herald that it was relatively quiet, with around 15 to 20 people. Another man, Craig Stoker, claims to have come face-to-face with a gunman whose bag allegedly bumped into him. When Stoker cursed at him the supposed gunman “turned around and said ‘do you want me to shoot you too?’ I looked into his eyes and they were crazy,” Stoker told the Telegraph. Stoker claims there were two others dressed like him. Police though have only confirmed there is at least one gunman. The Shahada is the testament of Islamic faith, which is one of the five pillars of Islam. A translation by Fairfax Media has established that the script on the flag is very precise, classical Arabic. Mass-produced flags typically skip over the more complex grammatical notation - such as short vowel signs - because they are hard to reproduce. This one is very precise in detail, suggesting it is not mass-produced.